Vibrant White: Does Vibrant White Work? 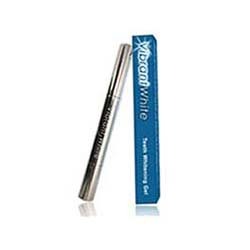 The makers of Vibrant White claim that it is Americas ‘most trusted teeth whitening product’. They go on to make some other statements about the product, such as how it was developed by professionals and is the ‘#1 discovery in teeth whitening’, but fail to back up the statements with any proof. There are other similarly questionable aspects on the basic, one page website. For example, several media outlets ( MSN, People magazine, TMZ) are cited as having featured Vibrant White, but no links to the articles are provided. There is a lack of real information on the site although there are some customer testimonials, complete with before and after pictures, and a reasonably good FAQ section. Despite the claims that the product is able to whiten the teeth by up to 14 shades (the average is between 5-6 shades) no clinical trials are shown as evidence of this. Vibrant White appears to be a convenient way of whitening the teeth. In the form of a pen, the gel is applied directly to the teeth and unlike most other products, does not require the use of trays, strips or lights. There are no ingredients listed for the gel formula although it is likely that it contains an amount of peroxide and the manufacturers describe it as being ‘professional strength’. The Vibrant White product is easy to use, requiring two applications per day, one of which should be at bedtime, allowing the gel to work overnight. The pen can also be used for ‘touch ups’ and if used correctly, the consumer should see results in 4-5 days. The only positive aspect of Vibrant White is that it is an easy to use product. Apart from the fact that most consumers prefer to be informed what ingredients are in a product, without knowing the exact amount of peroxide it is impossible to judge how effective it would be. Although Vibrant White is not the most expensive product on the market, at a cost of $49.99 for a one month supply, given the amount of complaints about it from independent consumers, it simply cannot be recommended as a good brand. With the large number of teeth whitening products available currently, it is important to research each product before actually making any purchases. Such products should be able to offer long term results-very temporary results will only make the overall cost accumulate quickly over time. Additionally, all products should obviously actually be able to noticeably whiten teeth. Furthermore, the ingredients used to provide this whitening effect must be considered to be safe and of the highest quality. Fortunately, there are actually a good number of whitening products that show promise in each of these requirements, and the below we've summarized each of the evaluated products in regard to these characteristics.